Provide comfort for the family of Linda Clarke with a meaningful gesture of sympathy. 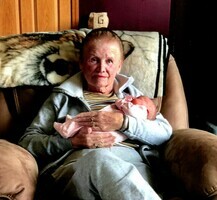 Linda Mae (Stadel) Clarke, age 78, of Kalamo Township passed away peacefully on Monday, February 11th, 2019 at her home. Linda was born in Charlotte, MI on February 5, 1941, the daughter of the late DeVere and Thelma (Barlond) Stadel. She was raised in the Bellevue area and attended local schools graduating in 1959. She was the wife of Dean Clarke. The couple was married in Charlotte, MI on April 22, 1961. They began their lives together on a small family farm in the Eaton Rapids area. Early in their relationship, Linda worked as a switchboard operator for Michigan Bell Telephone Company, but when her family began to grow, she focused all her attention on caring for her children and her home. After a short time at the Eaton Rapids farm, the couple purchased a farm in the Bellevue area where they raised their family together. Linda always wanted a large family, and took great pride in tending to her home, and her families needs. Each year she would spend time in the kitchen canning fresh food for her family to eat throughout the year. In her spare time Linda enjoyed Sudoku puzzles, cross word puzzles, and word searches. Linda loved animals, and named each animal on the couples farm. She had a special affinity for cats, and rescued every stray cat should could. She was preceded in death by her sister Ruth Walker. Funeral Services will be held at Nashville Baptist Church, Nashville, MI, at 11:00 AM on Thursday, February 14th, with Lester DeGroot officiating. The family will receive visitors on Wednesday February 13th from 6-9 PM and again Thursday beginning at 9:30 AM at Nashville Baptist Church. There will be a time of fellowship and funeral luncheon immediately following the funeral service at Nashville Baptist Church. Interment will follow the luncheon at Hillside Cemetery in Kalamo. In lieu of flowers memorial contributions can be made to The American Cancer Society, or the Humane Society. Provide comfort for the family of Linda Clarke by sending flowers.